Once upon a time, there was a lump of wood which fell into the hands of Gepetto, the carpenter. Gepetto's dream was to create a puppet that could dance and handle a sword. He would name this wooden puppet Pinocchio. So, Gepetto started to carve his lump of wood. He carved hair, and then gave it a forehead and a mouth. Just as he had finished the face, he noticed that the puppet's eyes were moving. The puppet was alive, truly alive, Delighted, the old man quickly carved the neck, the shoulders, followed by the rest of the body. The little puppet was hardly finished when he threw himself into the carpenter's arms to kiss him, and started to dance. 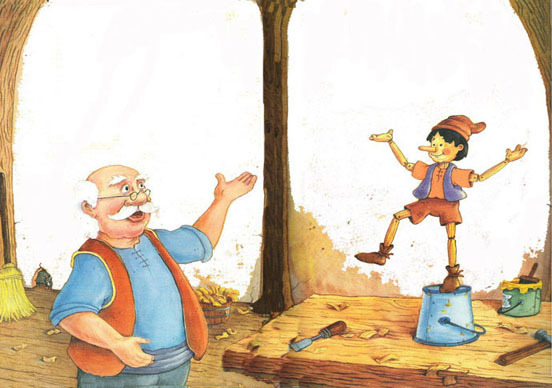 As Gepetto was very poor, he made Pinocchio some clothes from paper, a pair of shoes from bark, and a hat made from a loaf of bread. To become a real little boy, Pinocchio had to go to school. So the very next day, with a nice new notebook under his arm, the puppet set off. On the way he met a peasant who was so ugly that it was scary to look at him. His long beard was blacker than an ink blot. His eyes sparkled like red lanterns. Terrified, Pinocchio fled and ran as far as his wooden legs would carry him. He reached a filed where he found five gold coins. He decided to take these back to his poor father, the carpenter. But at the edge of the wood, Pinocchio met and injured fox and a blind cat who were limping along together. ''Hello. Pinocchio,'' said the fox. My'' what pretty gold coins you have. Would you like to make a thousand coins from your meager five? Well, at the foot of the Ninnies, there is a magic field that everyone calls the Field of Miracles. If you dig a hole and plant a single gold coin, you will find there, the following day, a tree laden with as many gold coins as there are grains on an ear of corn. Let's go there immediately!'' exclaimed Pinocchio forgetting all his good intentions about going to school. And they walked and walked. At twilight, his friends abandoned him, saying they had to go and see someone. So Pinocchio continued along the path alone, in the dense, dark forest. Suddenly two menacing figures leaped out at him from the undergrowth. Your money or your life!'' shouted the robbers, who were really the fox and the cat, disguised as robbers. The puppet ran a way through the forest. But suddenly, a trap closed around his heel. Pinocchio was seized by such a fit of trembling that every joint in his wooden legs rattled. As if by magic, a child appeared. She was as beautiful as an angel, with blue hair and a face as white as wax. She freed the puppet from the trap and told him in an enchanting voice, Little Pinocchio, take the gold coins to you father. I have lost them, ''lied Pinocchio, who really had them had in his pocket. Hardly had he uttered these words than his nose, which was already long, became even longer. It became so long that he could not turn his head without knocking his nose, The beautiful child, who was really a fairy, began to laugh. Why are you laughing, asked Pinocchio, suddenly embarrassed. I am laughing at the lies that you dare to tell me. But taking pity on him, the little fairy clapped three times and Pinocchio's enormous nose returned to its normal size. It serves me right! the puppet wailed. I wanted to be lazy and to have fun. but I followed the advice of dishonest friends. Bad luck has been following me around. If had stayed at my father's house, I would not be so unhappy. And he promised the fairy that he would be a good boy and would work hard at school. Before vanishing, the fairy clapped one last time and a pigeon appeared in they sky. Pinocchio, come with me, it said, I have just seen Gepetto. He is building a boat in which to travel across the ocean in search of you. He is prepared to face storms and gales just to find you again! We must save him before it is too late.'' Pinocchio sat on the pigeon's back and they flew eastward. Gepetto had already reached the open sea, and Pinocchio watched in horror as a wave larger than any of the others tipped the frail little boat on its side. The boat sank and Gepetto did not reappear. I fear that your father has been swallowed by the terrible shark, lamented the pigeon. This monster is larger than a five-story house. His mouth is so large and so deep that a carriage with sixteen horses could fit inside, Frightened by these words, Pinocchio lost his balance and fell into the sea. Luckily the wooden puppet knew how to swim, so he tried to reach an island on the horizon. But the terrible shark headed straight for him and swallowed him so roughly that he was knocked unconscious. Pinocchio finally woke up and saw a faint glow, deep within the monster's stomach. And at the end of a tunnel he found his father, sitting there exhausted. Dear father! I have finally found you. From now on I will be a good boy! Now, let's make our escape while the shark is sleeping. Together they climbed up into the monster's mouth. There they crept across its tongue and climbed over the three rows of teeth. Pinocchio threw himself in the water. Took his father on his back and began to swim. Reaching the shore of the far-off island, they fell into a deep sleep. The puppet dreamed of the beautiful child with blue hair, and when he awoke, his eyes opened wide, He was no longer a puppet but a real little boy.